Armani Kimayla Roberts was born May 14, 2012, in Hilton Head, SC to Gabrielle Webb and Derrick Roberts. 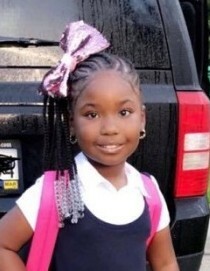 Armani attended Red Cedar Elementary School in Bluffton, SC. She was in the 1st grade. She also was a member of Bluffton Boys and Girls Club and attended their after school program and summer camp. “Ari” as she was affectionately known enjoyed spending time with her family and friends, reading, acting, recording videos, drawing, traveling and most of all she loved helping others. Although she was young, Ari touched many lives with her presence. She taught us all how to love and forgive. Ari was big on everyone being happy and loving each other. She loved all of teachers and friends and talked about them daily, they loved her as well. To know Ari was to love and appreciate everything about her sweet soul. On Wednesday, December 26, 2018, Armani Kimayla Roberts was called home. She will truly be missed by those who knew and loved her. Ari leaves to cherish her unforgettable memories: her mother, Gabrielle Webb of Bluffton, SC; her father, Derrick Roberts, Jr. of Hardeeville, SC; her siblings, Derrick Roberts,III, Jamontae Roberts, Amaya Roberts, Demarius Roberts; grandparents, Patrice Brown, Lee Webb, Delores Johnson and Derrick Roberts, Sr.; aunts, Latoyia Johnson, Michalee Webb, Jasmine Taylor, Diamond Taylor, Kendra Brown and Aaliyah Webb; uncles, Damion Miller, Karon Webb, Brandon Brown, Jamal Roberts, Rashein Johnson, Darius Chisolm and Kwamane Richardson; along with a host of cousins whom loved her dearly; to include her teachers and classmates at Red Cedar Elementary School and the Bluffton Boys and Girls Club. Armani Kimayla Roberts, 6, of Bluffton, SC died Wednesday, December 26, 2018, she was the daughter of Gabrielle Webb and Derrick Roberts. Funeral services will be held 11 am Saturday, January 5, 2019, at Campbell Chapel AME Church in Bluffton, SC (There will be viewing). Allen Funeral Home of Ridgeland, SC.